The Census Bureau produces annual updates of the population for the nation, states, counties, and metropolitan areas. The most recent state-level population estimates for 2018 were released earlier this year. In April, population estimates for counties and metropolitan statistical areas (MSAs) were released. These newly released population estimates provide an overview of current demographic trends impacting the Pittsburgh region. How the latest population estimates for the Pittsburgh region compare to other large MSAs, and how these trends have changed over the most recent decade, are detailed below. In addition, the Pennsylvania State Data Center has produced a research brief on what the newly released county estimates say for individual counties across the state. The 2018 population of the seven-county Pittsburgh Metropolitan Statistical Area* (MSA) is estimated to be 2,324,743, a decline of 5,540 or 0.2% over the previous year. These estimates reflect the population as of July 1 of each year. Among the 40 largest MSAs in the United States, Pittsburgh is one of six, including Cleveland, Chicago, Los Angeles, New York and St. Louis, to have experienced a population decline between 2017 and 2018. The 2017-2018 estimate of the region's annual population loss has slowed compared to the rate of population loss over in recent years, but is a reversal from overall population gains the Pittsburgh MSA was experiencing at the beginning of the decade. Population change results from a combination of natural population change, and migration. Natural population change is the difference between the number of births and deaths, which the Census Bureau compiles from public health and administrative records. Migration can be broken down into international migration and domestic migration. Net international migration represents the number of current residents who resided outside the country the year prior. Net domestic migration represents the change in population generated by population flows between regions within the United States. Migration flows are estimated from changes in the address of federal tax filings, administrative records, and other sources. While Pittsburgh experiences relatively low rates of international migration and negative net domestic migration, it is unique among large metropolitan areas for its natural population decline, due to more deaths than births in the region annually. Between 2017 and 2018, the Pittsburgh region is estimated to have experienced 4,655 more deaths than births. Tampa is the only other large metropolitan area currently experiencing natural population decline. The relatively older age demographics of the Pittsburgh region results in a relatively higher number of deaths and relatively fewer births per capita. Absent this natural population decline, the Pittsburgh region would have only experienced a far more modest level of overall population decline. Pittsburgh's population is estimated to have increased by 3,464 due to net international migration between 2017 and 2018. International migration includes both those considered immigrants, individuals seeking permanent residency in the United States, but also those currently residing in the region temporarily. This can include individuals here as students or in temporary work situations. 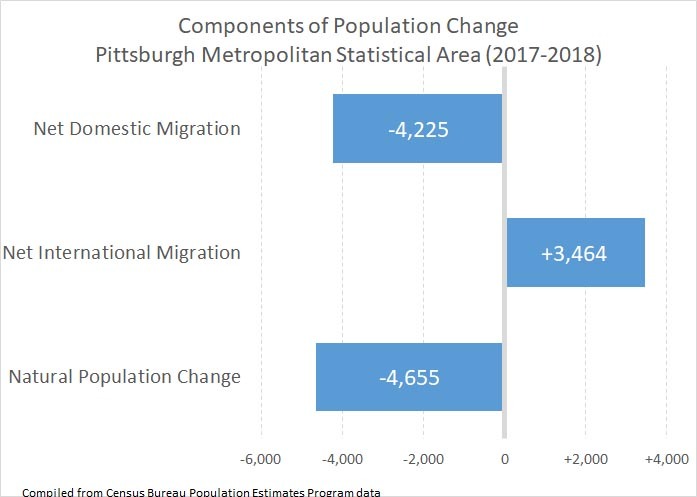 While both natural population change and international immigration flows have been relatively stable for the region over the most recent decade, the demographic component with the highest variation for Pittsburgh has been net domestic migration. Domestic migration includes economic migration generated by the workers seeking employment but also includes migration upon retirement, student migration, and other migration for other reasons. Between 2017 and 2018, Pittsburgh is estimated to have experienced a loss of 4,225 people due to domestic migration. While that loss is significantly less than a loss of 9,040 over the previous year (2016-2017), the region has not returned to positive net domestic migration experienced earlier in the decade. More information on the recently released population estimates for counties and MSAs is on the Census Bureau website here. Population estimates for individual Pennsylvania municipalities, reflecting the population as of July 1, 2018, are expected to be released by the Census Bureau in May. These annual estimates are derived from multiple sources of administrative and survey data. The 2020 Decennial Census will be the next complete enumeration of the population with initial results beginning to be published late in 2020. * The Pittsburgh Metropolitan Statistical Area (MSA) is currently defined as the following seven counties in southwestern Pennsylvania: Allegheny, Armstrong, Beaver, Butler, Fayette, Washington and Westmoreland.